Buffalo Bill Center of the West staff suggests the following references for visitors interested in further investigating The Battle of the Little Bighorn, or Battle of Many Names. Black Elk. Black Elk Speaks: Being the Life Story of a Holy Man of the Ogalala Sioux as Told to John G. Niehardt (Flaming Arrow). New York: William Morrow & Co., 1932. Brust, James S. Where Custer Fell: Photographs of the Little Bighorn Battlefield Then and Now. Norman, OK: University of Oklahoma Press, 2005. Burnham, Philip. Song of Dewey Beard: Last Survivor of the Little Bighorn. Lincoln, NE: University of Nebraska Press, 2014. Camp, Walter Mason. Custer in 76: Walter Camp’s Notes on the Custer Fight. Edited by Kenneth Hammer. Provo, UT: Brigham Young University Press, 1976. Chorlain, Meg, ed., The Battle of Little Bighorn. Cobblestone Series on American History for Kids, vol. 18, no. 8. Peterborough, NH: Cobblestone Publishing Company, 1997. Clark, Gerald R. Supplying Custer: The Powder River Supply Depot, 1876. Salt Lake City, UT: University of Utah Press, 2014. Day, Carl F. Tom Custer: Ride to Glory. Spokane, WA: Arthur H. Clark, 2003. Denzin, Norman. Custer on Canvas: Representing Indians, Memory, and Violence in the New West. Walnut Creek, CA: Left Coast Press, 2011. Dippie, Brian W. Custer’s Last Stand: The Anatomy of an American Myth. Lincoln, NE: University of Nebraska Press, 1976. Donovan, Jim. 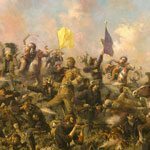 A Terrible Glory: Custer and the Little Bighorn: The Last Great Battle of the American West. Boston, MA: Back Bay Books, 2009. Elliot, Michael A. Custerology: The Enduring Legacy of the Indian Wars and George Armstrong Custer. Chicago: University of Chicago Press, 2007. Fox, Richard Allan, Jr. Archaeology, History, and Custer’s Last Battle: The Little Big Horn Reexamined. Norman, OK: University of Oklahoma Press, 1993. Goble, Paul. Red Hawk’s Account of Custer’s Last Battle. Lincoln, NE: University of Nebraska, 1992. Graham, W.A. Abstract of the Official Record of Proceedings of The Reno Court of Inquiry. Harrisburg, PA: The Stack Pole Company, 1954. Greene, Jerome A., ed. Battles and Skirmishes of the Great Sioux War, 1876‑1877: The Military View. Norman, OK: University of Oklahoma Press, 1993. Greene, Jerome A. Stricken Field: The Little Bighorn since 1876. Norman, OK: University of Oklahoma Press, 2008. Hardoff, Richard G. Hokahey! A Good Day to Die! : The Indian Casualties of the Custer Fight. Lincoln, NE: University of Nebraska Press, 1999. Hardoff, Ricard G. Indian Views of the Custer Fight: A Source Book. Norman, OK: University of Oklahoma Press, 2004. Hatch, Thom. Custer and the Battle of the Little Bighorn: An Encclopedia of the People, Places, Events, Indian Culture and Customs, Information Sources, Art and Films. Jefferson, NC: McFarland & Company, Inc., Publishers, 1997. Hutton, Paul Andrew, ed. The Custer Reader. Lincoln, NE: University of Nebraska Press, 1992. Kammen, Robert, Frederick Lefthand, and Joe Marshall. Soldiers Falling into Camp: The Battle of the Rosebud and the Little Bighorn. Encampment, WY: Affiliated Writers, 1992. Koster, John P. Custer Survivor: The End of a Myth, the Beginning of a Legend. Palisades, NY: Chronology Books, 2010. Langellier, John P. Custer: The Man, the Myth, the Movies. Mechanicsburg, PA: Stackpole Books, 2000. Liddic, Bruce R. Vanishing Victory: Custer’s Final March. El Segundo, CA: Upton and Sons, 2004. Lookingbill, Brad D., editor. A Companion to Custer and the Little Bighorn Campaign. Hoboken, NJ: Wiley Blackwell & Sons, 2015. Mardon, Allan. In Search of History: Narrative Paintings by Allan Mardon at the Bradford Brinton Memorial May 15‑September 7, 1998. Big Horn, WY: Bradford Brinton Memorial, 1998. Michno, Gregory. Lakota Noon: The Indian Narrative of Custer’s Defeat. Missoula, MT: Mountain Press Pub., 1997. Paxson, William Edgar,.Jr. E.S. Paxson: Frontier Artist. Boulder, CO: Pruett Publishing Company, 1984. Rankin, Charles E., ed. Legacy: New Perspectives on the Battle of the Little Bighorn. Helena: MT Historical Society Press, 1996. Russell, Don. Custer’s Last: or, The Battle of the Little Big Horn In Picturesque Perspective: Being a Pictorial Representation of the Late and Unfortunate Incident in Montana as Portrayed by Custer’s Friends and Foes, Admirers and Iconoclasts of his Day and After. Fort Worth, TX: Amon Carter Museum of Western Art, 1968. Russell, Don. Custer’s List: A Checklist of Pictures Relating to the Battle of the Little Big Horn, Fort Worth, TX: Amon Carter Museum of Western Art, 1969. Scott, Douglas D. They Died with Custer: Soldiers’ Bones from the Battle of the Little Bighorn. Norman, OK: University of Oklahoma Press, 1998. Skelnar, Larry. To Hell with Honor: Custer and the Little Bighorn. Norman, OK: University of Oklahoma Press, 2000. Stiles, T.J., Custer’s Trials: A Life on the Frontier of a New America. New York: Alfred A. Knopf, 2015. Taft, Robert. “Custer’s Last Stand” in Artists and Illustrators of the Old West: 1850‑1900. Princeton, NJ: Princeton University Press, 1953. Taylor, William O. With Custer on the Little Bighorn: A Newly Discovered First-Person Account. New York: Viking, 1996. Thomas, Rodney G. Rubbing out Long Hair: The American Indian Story of the Little Big Horn in Art and Word. Spanaway, WA: Elk Plain Press, 2009. Tillett, Leslie, ed. Wind on the Buffalo Grass: Native American Artist‑Historians. New York: Crowell, 1976. Utley, Robert Mr. Custer and the Great Controversy: The Origin and Development of a Legend. Lincoln, NE: University of Nebraska Press, 1988. Viola, Herman J. Little Bighorn Remembered: The Untold Story of Custer’s Last Stand. New York: Times Books, 1999. Welch, James with Paul Stekler. Killing Custer: The Battle of Little Bighorn and the Fate of the Plains Indians. New York: W.W. Norton and Company, 1994. Williams, Roger L. Military Register of Custer’s Last Command. Norman, OK: University of Oklahoma Press, 2012. Publications that are in print can be purchased from the Museum Store of the Buffalo Bill Center of the West by calling 307-587-3243 or 800-533-3838. You can also consult your local library. Books not in the holdings of your local library can often be borrowed through inter-library loan.